TheBurningSpear.com set to launch on March 18, 2016! 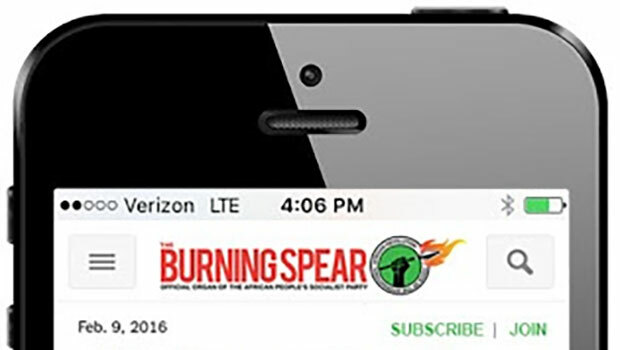 Uhurunews.com has served as the primary source for online news articles written from the perspective of the African working class for a number of years; but a recent decision made by The Burning Spear Editorial Board will create a new website, TheBurningSpear.com, which will launch on Friday, March 18, 2016. As the Uhuru Movement drew more Africans into revolutionary political life and The Burning Spear writing, editing and distribution staff grew significantly, leadership for The Spear believed it was time for a change. Setting TheBurningSpear.com as the namesake of The Burning Spear newspaper will create consistency across our platforms and build greater familiarity amongst the masses for The Burning Spear. The new site will be more user-friendly—cleaner, easier to navigate, and interactive—with updated features and more current and frequently posted news content. Editor-in-Chief Day Steer called on writers for The Spear to commit to producing at least two articles per week for TheBurningSpear.com. This will allow us to offer our revolutionary analysis of major news stories using our theory of African Internationalism and move us further along in winning the war of ideas. The Burning Spear staff is making a call for dedicated and experienced programmers and mobile app developers to join the Agitation and Propaganda (Agit-Prop) team. We need well-rounded programmers to update and maintain the new site. The dedicated programmers are encouraged to uphold the quality standard of the website that the African masses deserve. This is critical in winning the war of ideas. Mobile app developers are also critical as studies have shown that U.S. Africans have less access to broadband internet than white individuals. Amongst African youth, they are less likely to engage in discussions about politics over broadband internet as a result. African youth are, however, more likely to engage in such discussions by using their cell phones. The development and creation of The Burning Spear app are vital for reaching Africans, especially young Africans, and bringing them into a political consciousness. This app will give the masses access to African working class political commentary and updates about the work and growth of the Uhuru Movement directly on their smart phones. They will also be able to post content from the app to their social media pages and help the African masses win the war of ideas. In order for this to happen, we need app developers. Email us at [email protected] to join the app development team. Join The Burning Spear production team!